Question 1: In recent years, Internet use has expanded rapidly in China. You mentioned in your speech that China has 485 million internet users, which is the biggest online population in the world. How do you think this has affected China's overall development? Ambassador Liu: The impact of internet on China is profound and sweeping. China's access to the internet began in 1994. In the 17 years since then, the internet has not only been transforming communications, but also become a major driver of China's reform, opening-up and modernisation. Today, the internet is growing very fast in many sectors in China. As we speak, almost 40% of Chinese people are using the internet. That's 485 million people, the highest figure of any country in the world. Over 40 percent of China's internet users are registered on microblogging services, or Weibo in China. The number of Weibo users soared more than 200% from 63 million at the end of last year to 195 million in June 2011. This growth of microblogging indicates that as the internet develops and benefits more people, its role as a catalyst to socio-economic development becomes more visible in China. The way people work, study and live has started to change. And such changes can only be more profound in the years to come. First, the internet is an important driver of China's economy. We live in an era when the internet and real economy are increasingly inseparable. China is using the internet to upgrade traditional industries. This is part of our broader agenda to restructure industries and change our growth model. In e-commerce in China, the number of online buyers is increasing at almost 50% each year. All commercial activities online in China were worth 4.5 trillion RMB yuan, or 700 billion US dollars in 2010. So the internet may create totally new retail distribution systems in China in the fast growing second and third tier cities. China's largest online shopping website, Taobao, receives over one hundred million clicks everyday, way higher than Amazon and eBay. The internet has emerged as a strategic industry on China's path toward a low-carbon future. Second, the internet provides a big boost to cultural industries. Online games, cartoons, music and movies are growing rapidly, and making Chinese cultural industries more competitive. By 2010, China's online games had become a 32 billion yuan, or about 5 billion dollar industry, and we are today one of the largest online game consumers in the world. Third, the internet has facilitated government transparency. In the mid-1990s, China launched its e-government program. To date, most of the central and local government agencies have web portals, providing all sorts of services online. Such efforts have effectively raised government efficiency and transparency. President Hu Jintao, Premier Wen Jiabao and other Chinese leaders have frequent online exchanges with the public to listen to the concerns of ordinary citizens. Fourth, the internet is an important tool in people's life. In China, more and more people access information on the internet. People communicate and socialise on the internet to build closer relationships. And the internet has increasingly become a platform to find a job, open a company and fulfill a dream. With all these changes comes a new style of work and life. In summary, the internet is greatly accelerating the ability of China to evolve from a developing to a developed country. Cyberspace contributes to fast economic growth, cultural prosperity and government transparency. And it brings people a better life. Question 2: China has received a lot of criticism over the Government's close supervision of internet activities, while the Chinese government emphasizes it is necessary to guarantee its network security. How can China ensure internet freedom? 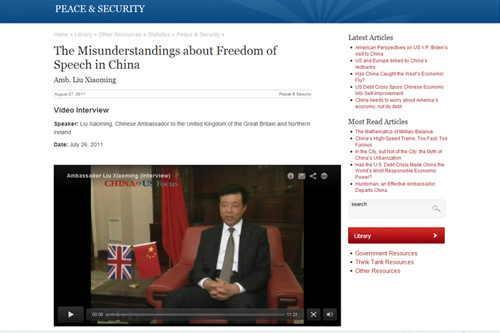 Ambassador Liu: There is a lot of misunderstanding by foreign people about freedom of speech in China. The Chinese Constitution guarantees freedom of speech. Evidence of this freedom abounds. In addition to the 485 million internet users there are over 2,000 newspapers, 9,000 magazines, and 700 million mobile phone users. People can express views and offer suggestions in a variety of ways on the internet. Tens of millions of comments are posted everyday on bulletin board sites, news websites, blogs and microblogs. Over 66 percent of internet users, that is 320 million, make comments online quite often. These include criticism and complaints about the government. And no comment is prohibited unless it breaks the law. But this freedom of expression has to be balanced by the responsibility of a government to protect the safety and security of all its citizens. This means that the internet must be managed by law. Where information breaks the law and threatens national security and common good this must be prohibited online. The Chinese government believes that cyberspace should be regulated like any other modern communication medium in the interests of public safety and security. Cyberspace cannot be left as an unregulated vacuum. In this approach China is in harmony with many governments worldwide; managing cyberspace by law is a practice prevailing all over the globe. Content that is harmful to the public as a whole is dealt with through legislation, technology and industrial self-discipline. In some parts of the world, regulators have been created to oversee the internet. In Britain, for example, the government led the effort to set up the Internet Watch Foundation. This is an organization with a mandate to monitor and remove pornographic, violent, terrorist, racist and other illegal content. Question 3: The recent security compromises of well-known companies such as Sony and Google seems to indicate that the cyber intrusions will increase. What is China's reaction towards those accusations that cyber-intrusions were conducted in China against foreign companies? Ambassador Liu: The Chinese government stands firmly against hacking and all other criminal activities that target the internet and computer systems. We have taken decisive actions to combat such activities. The IP address alone is far from enough to prove China's role behind such hacking attacks. Those with some knowledge of how the internet works understand such tricks. Sophisticated attackers won't leave behind IP addresses. Those who deliberately do so must have some ulterior motives. China itself is a victim of international cyber-crimes. We face grave cybersecurity threats from abroad. These threats are monitored by China National Computer Emergency Response Team (CNCERT). The CNCERT 2010 report shows that out of the nearly 480,000 Trojan server IPs found, 221,000 were outside China. Out of the 13,782 Zombie server IPs found, 6,531 were outside China. This means that almost half of the above cybersecurity threats come from outside of China. The report also shows that over half of the malicious domain names with illegal actions, such as planting Trojan and phishing, were registered outside of China. We are now in an era where the whole world is linked by the Internet. That means cybersecurity is a vital global issue that calls for international cooperation. No single country can deal with cross-border issues such as hacking, viruses or spam on its own. China strongly supports extensive international cooperation and exchanges in cybersecurity at multiple levels. Also, China is actively involved in important international and regional cybersecurity cooperation. Since 2006 the public security authorities of China have handled more than 500 requests of assistance for cyber-crime investigation from over 40 countries and regions. Three sessions of the China-UK Internet Roundtable and four sessions of the China-US Internet Industry Forum have been convened to discuss cybersecurity. The challenges of cybersecurity are hugely important for all the people of the world. The urgency of dealing with this issue mounts daily as we all become ever more dependent on the efficient operation of cyberspace. These challenges cannot be addressed by throwing accusations around. Global cooperation is the only right way forward.